Did you know that people that have been involved in low-impact auto accidents can still manifest injury? Whenever you’re hit by a moving object, particularly a road vehicle, the amount of torque and the weight of the car or truck can play a tremendous part in the extent of the injuries you sustain. 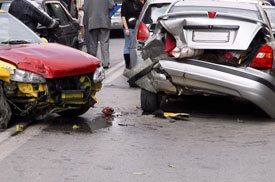 Been in an auto accident recently? Find out why it’s important to have your spine checked! If you experience any of the above symptoms following a car collision, the best advice I can give you is to get your spine checked immediately. Symptoms are fickle, and will often seem to fade. But if you experienced them within a couple of days of the accident you can be sure that you sustained, at a minimum, soft tissue damage. The key to avoiding future problems related to vehicular injury is early intervention. Many people can trace the origin of a particular nagging symptom to a car accident that they had experienced years before, but never had treated and corrected. An immediate spinal checkup in these cases would’ve made a world of difference!